Leaders of the G7, from left, European Council President Donald Tusk, Prime Minister Justin Trudeau, German Chancellor Angela Merkel, and President Donald Trump pose for a family photo at the Ancient Greek Theater of Taormina on May 26, 2017, in Taormina, Italy. 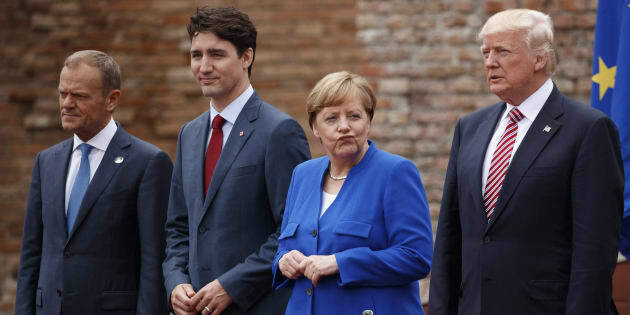 OTTAWA — Donald Trump may have a world view incompatible with fellow global leaders, but his presence is still desired at the G7, representatives from most of its member states told HuffPost Canada Tuesday. Over the weekend, France's finance minister, Bruno Le Maire, expressed deep frustration after the United States president used a national security clause to hit his country's most stable political and military allies with punitive tariffs on aluminum and steel imports. "It has been a tense and tough G7," Le Maire said in Whistler, B.C., where the G7 finance ministers were gathered. "It has been far more a G6 plus one than a G7. We regret that our common work at the level of the G7 has been put at risk by the decisions taken by the American administration on trade and on tariffs." Le Maire tweeted Tuesday that if the U.S. wants to "renew its dialogue with its historical allies, it was up to them to take the first step and show willingness to co-operate with clear signs of de-escalation." Canada, which is hosting the meeting of the world's top liberal democracies in Charlevoix, Que., Friday and Saturday, refused to set conditions on the Americans' participation. Trump is still expected to attend the gathering, a senior government official said. Any musings about a G6 being more productive without the U.S. president would send the wrong message, another senior official said. "What I can tell you is that we are going to make the G7 as productive as we can," Prime Minister Justin Trudeau's spokesman, Cameron Ahmad, told HuffPost. The forum's topics — economic growth and the future of work, gender equality, climate change and oceans protection, peace and security — were chosen as areas where common ground should be achievable. But the trade dispute threatens to dominate the talks. "There are going to be issues which we don't agree on, and that's always the case, but we are expecting to have frank discussions and good conversations about them," Ahmad simply said. While it is impossible for Trudeau to disinvite Trump, Fen Hampson, esteemed chancellor's professor at Carleton University's Norman Paterson School of International Affairs in Ottawa, said it would be a more productive session without him. "You can't disinvite. But should Trump for whatever reason decide that he doesn't want to come — and he has a potential excuse with preparation for the upcoming meeting with the North Korean leader — I think it would be a much better meeting, because then those countries who are deeply affected from the trade war he has initiated could discuss strategy and how to maintain a common front." Colin Robertson, vice-president and fellow at Canadian Global Affairs Institute, thinks it important to have the U.S. at the G7 so that it doesn't just look like a "whine session." While the leaders' summit this Friday and Saturday may end up being a disaster, Robertson argues that the real value of having the U.S. on board is that they are involved in all the meetings leading up to the leaders' summit. "It is sort of a continuity for the future." In 2014, the major liberal democracies of the world threw Russia out of the G8, turning the elite club back into the G7. The forum of big industrialized nations, which has existed for more than 40 years, includes: Canada, the United States, Britain, France, Germany, Italy, Japan, and, although not included in the tally, representatives from the European Union. Kicking the United States out of the G7, however, would be a big move that could prove counterproductive. "I think they [should] keep it the way it is and just hope for a president who will take a different view," Robertson said. "The whole thing is about tying Gulliver down, and even though this Gulliver may not be for tying down, at least getting him in the room is important." While the G7's outcomes are usually based on consensus, the U.S. has been sidelined in other forums recently. At the OECD's ministerial council meeting last month, the chair noted that everyone had agreed on the importance of multilateralism as the most effective model to build peace and security, but one member, without naming the Americans. Wednesday, Germany's chancellor Angela Merkel said she expects the G7 talks to be "contentious" and hoped that the members would not "keep watering down" commitments just to get Trump onboard. "There must not be a compromise simply for the sake of a compromise," Merkel said, according to an Associated Press report. Having Canada, as host, issue a final statement rather than a joint communiqué might be more honest, she said. In Ottawa, Eva Ricarda Willems, the first secretary at the German embassy, stressed her country's firm commitment to a multilateral approach. In a shared press release, Germany noted the U.S. decision to impose steel and aluminium tariffs was a move universally condemned by its allies as a violation of international trade rules. "The measure threatens to escalate into a downward spiral, which will ultimately be detrimental to everyone," Merkel's government said. Eric Navel, France's communications counsellor at the embassy in Ottawa, noted his government's message championing strong multilateralism. French President Emmanuel Macron is in Canada's capital Wednesday for a two-day bilateral visit ahead of the summit. Macron and Trudeau have both tried to charm Trump to no avail. Macron did not get the outcome he wished in safeguarding the Iran deal, Trudeau is still waiting on Trump to finalize NAFTA talks. A diplomat from one of the G7 countries who did not want to be identified because he didn't have clearance to speak with the media told HuffPost that there were a lot of other issues beyond trade, such as North Korea, that need to be discussed with the United States. "Sometimes we don't agree on certain issues but it is important that G7 countries continue to engage, because we share fundamental values, like human rights and democracy, and so on. Of course, democracy is now challenged," he added with a nervous laugh. "But we respect, the democratic system." Another diplomat who did not want his country identified echoed the sentiment that the G7 is a long-standing alliance that can "maturely address political differences" in a full and frank manner. An official with the Italian embassy in Ottawa, Francesco Corsaro, said his government is a strong G7 supporter. "We want the G7 to stay G7." "They don't really want to kick the Americans out," Hampson told HuffPost. "It's the biggest economy in the world and the leader of the Western alliances. But when it is behaving badly, a time out isn't necessarily a bad thing."